Organic. Fair Trade. Contains the oil of 20 avocados. A versatile everyday oil. For all high heat cooking, salads, and sauces. Certified kosher.Organic Fair Trade extra virgin avocado oil The goodness... All the natural goodness of avocado. High in Vitamin E, monounsaturated fats, beta sitosterol and lutein. Highest plant source of Co Q10. Contains no trans fats, additives, preservatives or artificial ingredients. 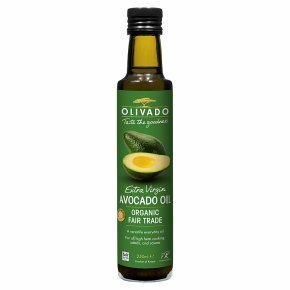 Quality Extra Virgin Avocado Oils require careful fruit handling, cooling and ripening. The flesh of the avocado is mechanically separated from the skin and stone and the oil is extracted under 45°C. The taste... The smooth, buttery taste of ripe Fuerte avocado. It's perfect for gentle heating in a frying pan as well as high heat of up to 255°C. Drizzle over salads and vegetables and it's great with seafood too.